An initiative by Dubai Customs facilitating the speedy and hassle-free movement of transferred and transhipped goods augurs well for the supply chain and logistics industry in Dubai and the United Arab Emirates (UAE). Dubai has established itself as one of the world’s major multimodal hubs over the years, due to its strategic location and excellent infrastructure. The concept of a hub involves the deconsolidation of different consignments of air or maritime transhipment cargo destined for different countries, arriving on board an incoming cargo ship or flight. Within very tight timeframes, this cargo has to be sorted at the port or airport, and then placed on board connecting flights, vessels or trucks according to its respective end destination. In order to facilitate such operations, Dubai Customs announced the introduction of a Virtual Freight & Logistics Corridor (VFLC) in early May 2015. The Corridor aims to eliminate remaining barriers to these operations in order to ensure the speedy and hassle-free movement of goods being transferred or transhipped. Dubai’s multimodal transportation and logistics cluster comprise two main economic sectors: transport, storage and communication on one side; and wholesale/retail trade and repair services on the other. Together, these economic activities account for over 40% of Dubai’s gross domestic product (GDP) and over 30% of total employment. Industries in these sectors are involved in logistics operations, and provide storage facilities for cargo that is in transit or under a local importation procedure. Before the implementation of the VFLC, consolidated cargo, which can include cargo for local consumption or cargo for transit/transhipment, had to be deconsolidated at the port of landing in separate Customs-approved facilities for handling these kinds of operations. Agents who did not have warehouses at the port or airport but in the free zone had to hire or build separate facilities for their deconsolidation operations, resulting in most companies having facilities in more than one zone. The practice was to move the cargo using manual documentation to a Customs-controlled deconsolidation area attached to the same cargo channel. In the case of sea/air shipping, which consists of moving cargo part of the way by ship, and then by air, it was not permitted to move air cargo into a deconsolidation facility located at a seaport or vice versa. The movement of goods between Dubai Customs centres located at various ports, border points and free zones could take up to several days, requiring the submission of paperwork, the payment of fees, and the provision of a cash bond or a bank guarantee. With the implementation of the VFLC, any registered company can now move cargo by filling in and sending Customs a Cargo Transfer declaration online. Consolidated cargo moving from the port of landing to another location where the client maintains warehouses for deconsolidation can be moved in under a few hours, without the need for the client to submit a cash bond or a bank guarantee, both of which have been replaced by a virtual guarantee. The earlier barriers of moving cargo between air and sea locations are eliminated, and those companies having warehousing facilities in the free zone can now use such facilities for consolidation or deconsolidation operations without having to hire or build separate facilities. This results in substantial cost reduction, as a company no longer needs to own and manage separate warehouses for multiple purposes. It also reduces expenditure on storage charges, and improves delivery standards by cutting the total time taken to deliver cargo. The VFLC connects the logistics hubs – airports, seaports and free zones – to a single platform. Access to the Corridor is granted to freight forwarders, cargo handlers, consolidators and deconsolidators with warehouses in a Customs-controlled area. Both the company and the warehousing facility have to be registered, and both operations are cost-free. Registered operators benefit from a virtual guarantee system. Unlike other financial credit facilities, this virtual guarantee does not require the payment of a bond or back-up by any third party guarantee provider, such as a bank. The amount is estimated according to the volume of an operator’s transactions, and is credited to the operator’s account. While processing the Transfer Declaration online, a client can use this account to settle any Customs duty liability virtually. Upon successful completion of the transfer of the goods from one Customs-controlled location to another, the Customs duty amount will be reversed to the virtual guarantee account. The account balance is then available for further transactions. Customs inspectors seal the truck upon departure and track its movement until it reaches the Customs centre of its declared destination. 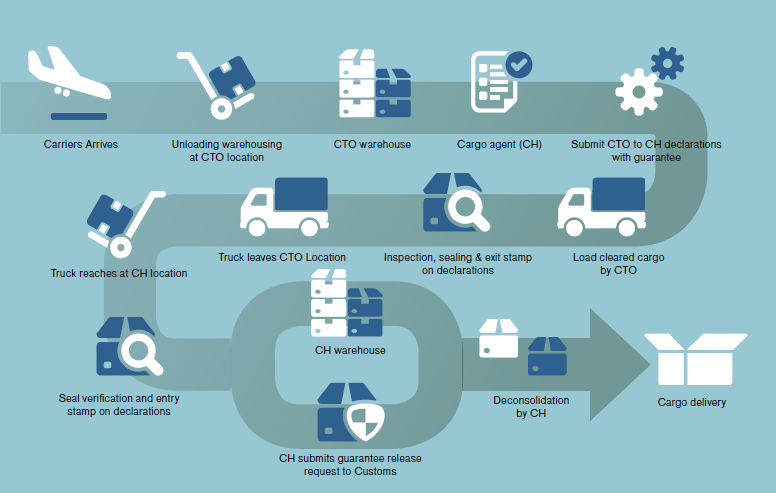 Since the movement of cargo between two Customs-controlled centres is tracked, there is a fair balance between facilitation and control demands. Moreover, Customs reserves the right to inspect cargo at its departure and/or on its arrival by using X-ray equipment. The 15 companies who partnered with Dubai Customs in the execution of the pilot provided positive feedback, explaining that the VFLC helped them to improve their business performance and operational efficiency. They were selected for the volume of their operations, their compliance level, and, of course, the fact that they had to move cargo from one location to another. For these companies and their clients, the major factor is time. Utilizing the VFLC allowed them to transfer cargo from the airport terminal or the seaport terminal to their facility, and to deconsolidate it with a minimal amount of information to be uploaded online and with instant approval, thereby enabling them to save time and money, and satisfy their clients’ needs. More than 12,000 transfers of cargo, weighing over 64,000 tons, were processed in the six months from November 2014 to April 2015. Subsequently, deposit-related financial burdens have, during this time, been considerably minimized by some 120 million UAE dirhams (about 33 million US dollar). More companies are expected to begin using the VFLC platform, marking strong involvement from the business community in joint initiatives and innovative work mechanisms that facilitate trade and boost economic activity. As Dubai will host the World Expo in 2020, with hundreds of pavilions and exhibits, the virtual corridor, and the key role it plays in ensuring the efficient movement of cargo, could not have been implemented at a better time ahead of this global event.